The business of apps is thriving. Around the close of 2015, Google Play contained around 1.8 million apps, while the Apple Store boasted 1.5 million apps in June 2015. Estimates peg consumer expenditure on mobile apps at $50 billion for 2016. This makes the mobile app space both an opportunity and a challenge for new app developers and businesses. Entry barriers are high due to the competitive nature of the space. Consumers have seen all kinds of apps and may be experiencing an overload, which means you need to innovate in order to stand out. Brand recognition is difficult in the app arena. Making your app available for free and marketing it well might give you an edge in terms of downloads, but this will obviously not generate revenue. On the other hand, a paid app does look like a guaranteed source of income if it takes off. The price tag, however, may discourage users from downloading the app. The decision on whether or not to make an app free is not easy. Let’s look at what research and trends indicate. The pricing model should be dictated by the nature of the app and how likely your target audience is to pay for it. Paid gaming or selfie apps directed at teenagers, for example, are unlikely to elicit a huge number of downloads. Paid apps directed at business users, on the other hand, may receive a better response. Your paid app is also unlikely to gain hundreds of thousands of downloads if there are a number of free alternatives to it. Apps that offer niche or high-quality services, solve a tricky problem, or fulfill a need that few others do are likely to receive many downloads. If yours is a security-related app, for instance, people would be more inclined to experiment with it, since security is such a pressing issue for most of us. The number and nature of reviews your app receives will also affect its performance. If an app is of high quality and rated at least four stars out of five, it will be downloaded more frequently based on the reputation it has garnered. The trend is firmly towards making apps available for free and monetizing them through native advertising and in-app purchases. However, you have to offer something unique and value-based, your paid app will succeed, especially if it is priced relatively high for an app. 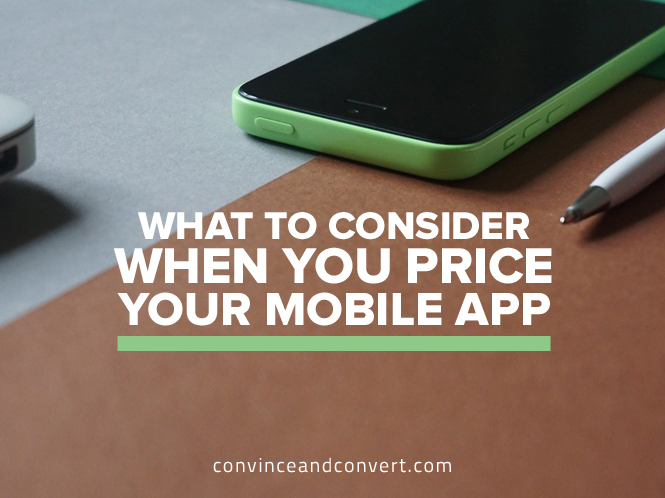 Before you decide how to price your app, consider these options. This functionality helps facilitate the sale of third-party services/products from within the app. In-app purchases are a major source of revenue for developers of free as well as paid apps. Revenue from in-app purchases is estimated to reach $28.9 billion by 2017. That constitutes 48.2% of the total revenue generated by mobile apps! Developers have to take care when implementing in-app purchases and advertisements. Frequent pop-up ads tend to annoy users. That, however, won’t be the case if the rest of the user experience within the app is up to their liking and if the advertisements are included in a way that does not intrude on their experience of using the app. A classic example of an annoying ad is a pre-roll video that plays soon as an app is launched, or ads that keep popping up each time you hit the back button on the mobile device. They are disruptive, ugly, and a turn-off. However, when ads are woven into the content, or do not pop up repeatedly (making users feel helpless), they will not just put up with them—they’ll pay attention to the content within the ads, as evidenced by the revenue generated by in-app purchases. Irrelevant pop-ups are annoying enough to make users uninstall an app. If I’m perusing a productivity app, I might not be too inclined to entertain pop-ups about single people living in my area or cheap tickets on travel to Dublin. But an ad related to the niche of productivity itself might hook my interest. With native advertising, ads are seamlessly woven into the content, sometimes even enhancing the user experience, but never detracting from it. This is where you can maximize the revenue you can generate from in-app purchases. Offer the basic model of the app for free, and implement a features-based pricing model. It is far better to start with a free app and get users to pay for certain features as they move through the app. People are more likely to pay for an upgraded experience, especially if they are happy with the overall quality of the app. Ease users into paying for features, convincing them that it will be worth their money. They should not feel cheated when they are prompted to make a purchase to unlock a feature. We recently created an app for a client called 100’s to Happiness. It’s a daily fitness program that guides you through 100 days of Pilates workouts for beginners. The app is available on the web, Android, and iOS as a free download. The 100 core exercises are free, but there are virtual class subscriptions available for purchase through the app. Gaming apps have also mastered this technique. Candy Crush Saga is another great example. The game is free to download and play up to a point. Later on, when you are fully engrossed in it, you are prompted to buy a star or share with friends on social to unlock the next level, or wait for a few days before you can proceed. Those addicted to the game can hardly wait! It’s a wickedly clever strategy of making money off of the app. It’s far easier to pay $0.99 for an app than $3.99. It’s psychological. Even though $0.99 is not free, it is low enough not to pinch the vast majority of app users. It’s a safe bet, considering that $0.99 is not a big amount to lose even if the user experience does not match up to the users’ expectations. With a higher price tag, expectations from an app increase. It looks too much like a gamble, especially for a new app with fewer than a thousand downloads and hardly any reviews. Given the plethora of apps on the Apple App Store and Google Play Store, consumers may feel it’s not worth it. A low price looks far more assuring if the app has gained popularity in certain circles, and all those downloads can make a significant difference to the revenue generated. Some consumers love apps that don’t display in-app advertising at all, and wouldn’t mind shelling out a dollar or two to keep their user experience entirely free of advertisements. There is a reason the app space consists heavily of free apps. Paying for a newly launched app requires a leap of faith. You must offer something extraordinary to get people to pay for it, which is getting harder to do. Previous poor experiences with paid apps can put people off such apps forever. There are also not many apps that don’t have good quality free (or cheaper) alternatives, so the case for paid apps is getting more and more difficult to make. What has been your experience in the app space? Do you have a mobile app? How did you make the decision to make it free or paid?